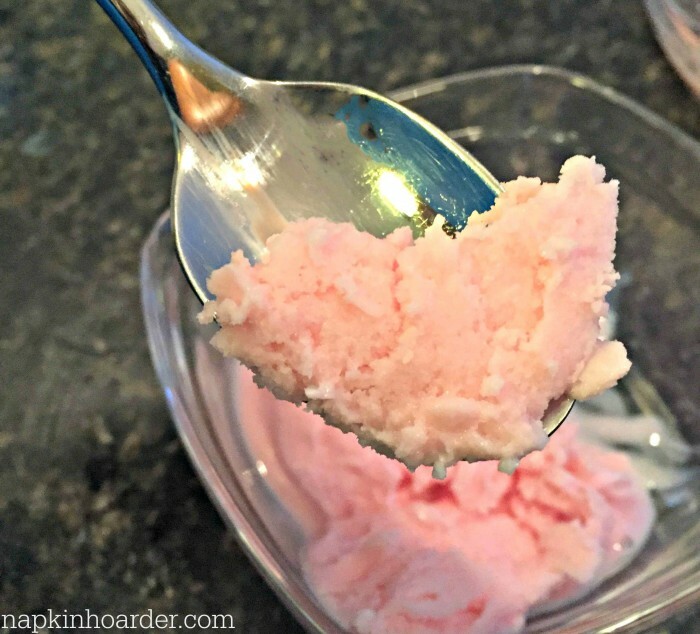 Homemade Strawberry Frozen Yogurt Made with Stonyfield yogurt, a YayLabs Ice Cream Ball, and a whole lot of fun! Disclosure: Thanks to Stonyfield Yogurt and YayLabs for providing the yogurt and the super cool SoftShell Ice Cream Ball! All opinions are always my own. July always starts off with a big bang – the end of the school year, the kickoff of our family’s birthday month, and 4th of July. The rest of the month is always full of celebrations, family visits, and camp. This year, we also threw in a move to a new home. So we decided to wrap up this month with some homemade frozen yogurt to celebrate the whirlwind of July. I’ve always wanted to try to make my own ice cream and frozen yogurt, but was a little skeptical about how it would turn out and how difficult it would end up being. So, when YayLabs offered me one of their Ice Cream Balls to use with some Stonyfield Yogurt, I jumped at the chance to make my own frozen yogurt! We used the instructions for frozen yogurt from YayLabs and some lowfat Strawberry Stonyfield yogurt. I had some trouble finding the rock salt at our local grocery store, but found it online and ordered from Amazon. 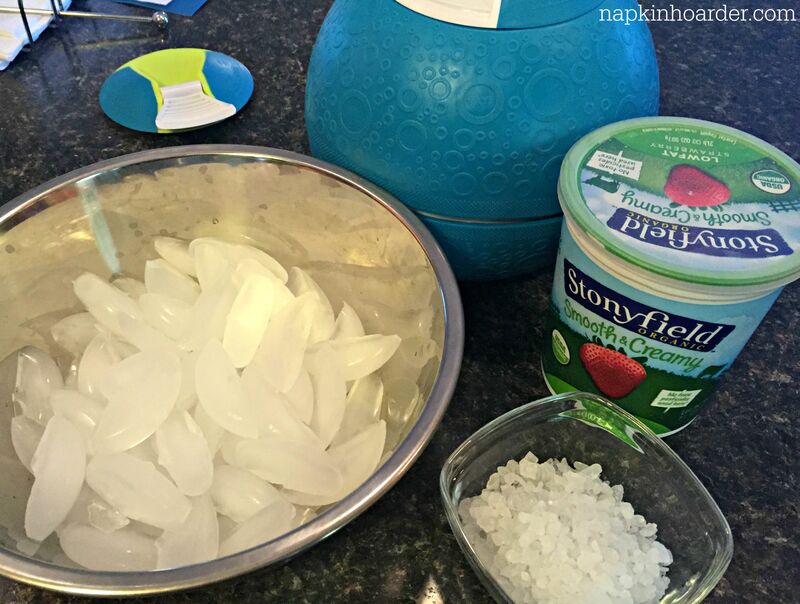 Just some ice, rock salt, yogurt, and the YayLabs ice cream ball – all the ingredients you need for a summer time treat! Put yogurt into the metal cylinder and make sure to leave about an inch at the top. Close securely. Fill the other side with as much ice as possible, then add the 1/2 cup of the rock salt. 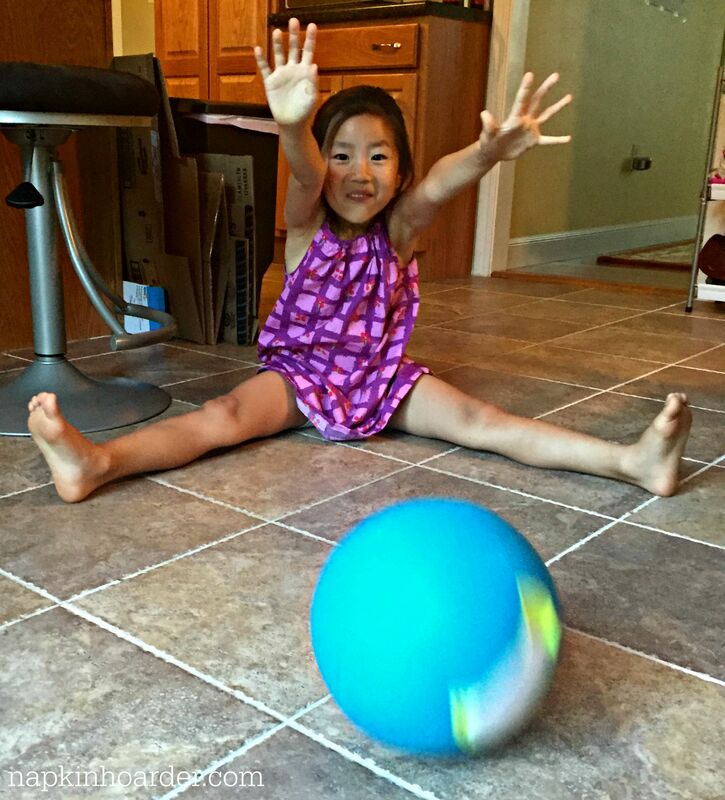 Then, roll the ball away! Make sure you don’t drop, kick, or throw the ball. You want to roll the ball for about 10 minutes, then scrape the frozen yogurt off the sides with a plastic or wooden spoon. Mix it up and close the lid. Check the other side and add more ice and up to 1/4 cup more rock salt, if needed. Roll the ball for at least another 15 minutes or so. The longer you roll the ball, the firmer the ice cream will be. Scoop out and enjoy your homemade frozen yogurt! We added some cut up strawberries and blueberries as topping to ours. The whole family got involved in rolling the ball! Thanks again to YayLabs and Stonyfield Yogurt for helping us celebrate the last day of July with a delicious and fun treat!